Alfred Edgar Truckell was born at Titchfield near Southamption in 1853. His mother died shortly after the birth of her next child and the young Alfred moved to Dumfries to be adopted by his paternal aunt Hannah Truckell and her husband James Duncan. Educated at Dumfries Academy he served his apprenticeship as Cashier with Messrs. Walker and Sharpe, Solicitors, at the Western end of the New Bridge, being for many years thereafter their cashier until his appointment, about 1904, as Conservative Party Agent for Dumfriesshire. He was a Sergeant in the Galloway Militia and a high Tory in his politics. 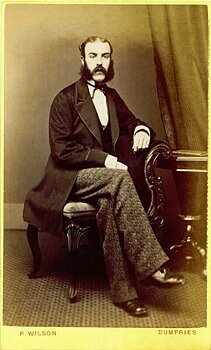 He was elected a member of Society on 8th October 1880 and as joint Secretary to Robert Service on 11th November 1881. 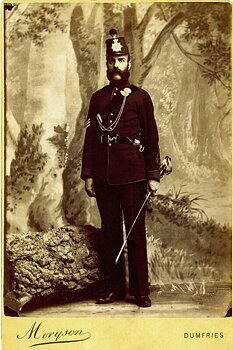 He resigned his post as assistant Secretary on 13th October 1882 following a controversy which was regarded as the introduction of politics into Society business — the matter being reported in the press of the day. He was also for many years Treasurer of the Astronomical Society which ran the Museum and Camera Obscura — and used to organise musical evenings on the Museum lawn, advertising 'Balloons will Ascend' — these were paper bags with candles under them — one got as far as Caerlaverock, eight miles downstream. He died at Carlisle in 1933. His grandson and namesake (1919–2007) was a most significant member of Society (see A.E. Truckell among the list of Editors).